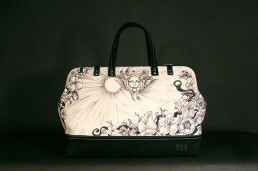 This bag belongs to artist Lisa Nelthropp, one of the original members of The League. On the front there is a lotus flower representing the awakening of the spirit. The drawing in the circle on that back represents a 19th Century Chinese Canton ware plate. In the plate, Lisa illustrates her ideal scenery complete with mountains, a river, a boat and a quintessential church from that era, bag 028.